First and foremost, planting at the appropriate time (late fall through early spring) is key to survival for desert native plants. This allows the root system to become established during the cool, rainy season, well before the harsh summer months. It is in our nature to buy bigger plants because we want the end result right now; however, it is better to plant smaller natives because they will not develop a damaged root system from growing too long in the container, and the roots will grow faster in their new home. Deep roots are a critical element in a plant’s drought-tolerance. If a native plant has been kept in a pot too long, the roots will hit the bottom of the pot and start coiling. This can cause long-term damage to the roots, and hamper the tap root from reaching its full potential as a lengthy “straw” penetrating into deep, moist soil. There is some discussion about whether to use a planting mix, mulch, or neither when plant­ing natives. One thought is that because they are nursery grown, they have been spoiled with optimal care, and to set them out in the world with poor soil conditions from the start would set them back. Once they out-grow the amended soil they are planted in, they will be stronger and better able to continue on their own. As the composted mulch breaks down, the humus it contains binds with soil particles to actually improve drainage conditions over time. This holds true for poorly-draining soils, such as caliche and clay, but granitic and sandy soils are fast-draining naturally, and don’t require amendments to improve drainage. A second thought is that plants which are native to our “Creosote Bush Scrub” habitat have adapted to so little organic material in the soil, no amendments are needed during planting. 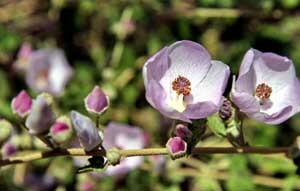 While soil amend­ments may be optional for some of our desert native plants, one plant that seems to hate soil amendments or fertilizer of any kind is creosote. 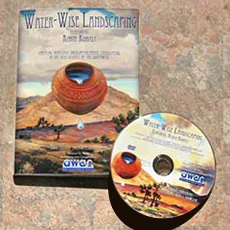 Native plants from other (more moist) California regions seem to tolerate or appreciate some soil amendments during planting; however, native plants from all habitats in the Mojave and Colorado Deserts except streamside or marsh habitats seem to grow best when planted with no added soil amendments or fertilizers. Most desert natives (especially cactus and all succulents like yuccas and nolinas), do best with no added soil amendments. Do not fertilize any desert natives. Most native species have difficulty becoming established if planted in the heat of summer. The best approach is to postpone planting until late fall. In high desert climates, postpone planting in early fall if temperatures are still warm, as tender new growth encouraged by the warmth may freeze as winter arrives. Later (cooler) fall planting is less likely to encourage new leaf growth before the plant’s first encounter with winter freezes. Early fall plantings are safe in low desert areas, as winter frosts are uncommon. If you have to install plants in the summer, consider providing temporary shade to native plantings. Use burlap or other mesh cloth sup­ported by stakes on the sunny side of the plant to create a cooler micro-environment. 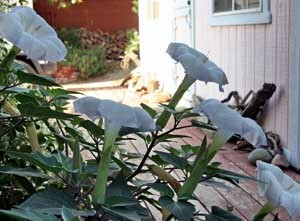 Don’t drape the shade fabric over the plant, as this will create even hotter conditions. Remem­ber, if you wait until the fall or early spring to install native plants, everything is easier for both you and the plants.